Used for producting high demand of disposable fresh/fast food,fruit plastic container,and pharmaceutical,wine,electrical blister packaging,etc. 1. Fully servo driven machine.no noise.no vibration,forming good and fast. 3. Can be adapted to a variety of materials,and the products thicker 8% than the average machine products. 5. Electric furnace temperature control system uses intelligent automatic compensation control,a control,a control of a regulator,easy to adjust the temperature uniformity,easy to use,simple,fast heating,low temperature three times up and down the oven roast slices. 6. 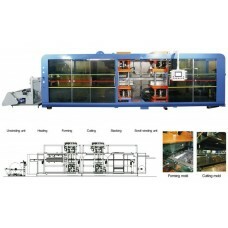 Forming,cutting die servo-driven,two-way adjustable for upper and lower mold stroke,in which the upper mold electric adjustable in clamping direction. The upper and bwer molds height position can be adjusted conveniently and fast under the clamping state;lower mold in clamping direction readily accessible buffer,increasing the clamping speed,avoiding shock. 7. 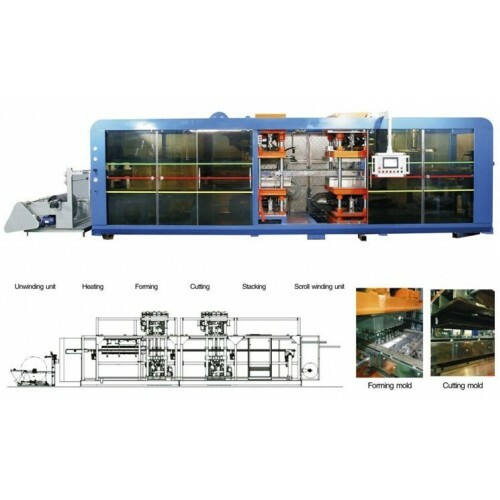 Auto cutting,auto counting,auto transmission by PLC. 8. Labor saving,only 1-2 workers packing. lid,fresh tray,moon cake tray,disposable food tray and boxes,instant noodle bowl lid, the tea/coffee cup lid,beverage cups,ice cream cups,jelly cups, boxes,household plastic packaging containers.